Also increases your Max Magicka while slotted. Reduces the cost and increases the radius of the reveal. You also prevent the stun and reduce the damage from stealth attacks while slotted. Magelight: Cost: [5671 / 5581 / 5491 / 5401] Magicka. Inner Light: Cost: 5400 Magicka. Radiant Magelight: Cost: [3511 / 3421 / 3331 / 3241] Magicka, Radius: 12 meters. Magelight creates a light which orbits around you, revealing all stealthed and invisible enemies around you. A target revealed this way cannot return to stealth or invisibility for 3 seconds. It also passively increases your Spell Critical while slotted. 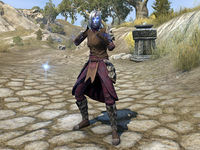 The Inner Light morph also increases your Maximum Magicka while slotted, while the Radiant Magelight morph reduces the cost and doubles the radius of the ability, while also passively decreasing damage from stealth attacks while slotted. This skill is most useful in PvP, as very few NPC enemies use stealth attacks. Before Update 10, this skill was a toggle that increased your Spell Critical while active, but also decreased your Maximum Magicka. Inner Light increased Maximum Magicka instead if decreasing it, and Radiant Magelight revealed hidden or invisible enemies, prevented being stunned by stealth attacks, and reduces damage from stealth attacks. Before Update 6, this skill was a toggle revealing hidden and invisible enemies to the caster, while increasing Spell Critical and decreasing Maximum Magicka while active. Inner Light further increased the spell critical, while Radiant Magelight decreased stealth attack damage for nearby allies. Inner Light is a recommended morph for the Inferno Dragon, Deathweaver, Blood Magus, Elemental Arcanist, Eldritch Mender, Gleaming Champion, Beacon of Hope, and Beast Caller builds. This page was last modified on 8 September 2018, at 16:56.